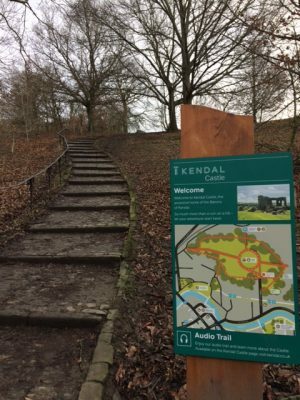 K endal Town Council have co-ordinated an improvement project at Kendal Castle to upgrade paths, install new welcome signage and create new interpretation panels. Thanks to funding from South Lakeland District Council and Cumbria County Council we have enhanced Kendal Castle to a standard that reflects how much the Scheduled Ancient Monument and surrounding green space is valued in Kendal and beyond. The new interpretation depicts life in Kendal and within the Castle walls throughout the Medieval period. Have a look at the medieval map of Kendal to discover how little some Kendal street names have changed and use the ‘Look Through’ panel to see the former grandeur of the Castle’s entrance. To download the audio trail that accompanies each interpretation panel follow this link to the Visit Kendal website.